The 15th International Congress of the GRCA was held on 20th-23rd April 2008 in Prague, Czech Republic. Copies of all the papers presented at the 2008 Congress are available to download by clicking on the Paper title in the list below. Keynote Speech: GRC in the past and in future. Basic research on GRC Recycling. The influence of component change of raw materials on GRC durability. Role of alkali-resistant glassfiber in suppression of restrained shrinkage cracking of concrete materials. Measurement of interfacial bond properties in GRC using a fibre push in test. Influence of siliceous material on durability of GRC based on Portland cement. An evaluation of the use of finely ground E-glassfiber as a pozzolan in GFRC composites. 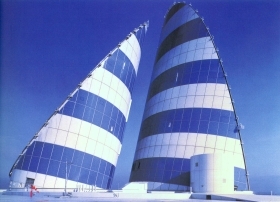 The use of a continuous mixer and a fast-setting cement to produce GFRC architectural products. New range of AR glassfibres for better control of cement paste rheology. Improvements in batching and mixing systems for GRC. Introduction to the new interactive GRCA Fixing Guide. Glyn Jones. BSCP Civil and Structural Consulting Engineers, Leeds, UK. European Standardisation of Glassfibre-reinforced Cement (or Concrete). Modelling of Aging Response in Glassfibre-reinforced Concrete Flexural Specimens. 3D CAD utilities and their place in the design and detailing of GRC elements. Innovation and development of decorative concrete. Structural permanent GRC formwork revisited. GRC furniture in precast prison units. F. Barth. Universidade Federal de Santa Catarina (UFSC), Florianópolis, Brazil. Cylindrical formwork from filament wound GRC. 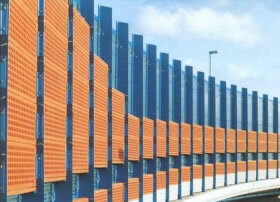 Glassfibre-reinforced concrete sound protection walls. Use of architectural integrally finished GRC as permanent formwork on a residential development in Hong Kong. GRC production for the Venetian Hotel in Macau. GRC in the Czech Republic and Russia: development of the ORTODUM company. High productivity and near-net shape manufacture of textile reinforcements for concrete. Improvement of bond behaviour and durability of AR-glassfibre-reinforced concrete by polymer-fibre coatings. Shear force strengthening of large reinforced concrete components using textile-reinforced concrete (TRC ). J. Hegger, M. Horstmann, M. Zell. Improvement of the load-bearing capacity and durability of textile-reinforced concrete due to the use of polymers.